Lobular carcinoma in situ (LCIS) is a form of in situ neoplasia that develops within the terminal lobules of the breast. It is extremely rare in males due to the lack of lobular development in the male breast. Furthermore, there is scarce data on the utility of screening MRI for male patients who are known to have high risk lesions. We herein report a rare case of LCIS in a male breast discovered incidentally on pathologic analysis of the breast tissue, which had been removed during breast reduction surgery for gynecomastia. 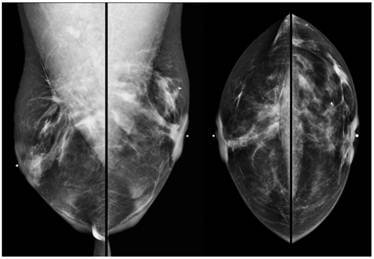 Invasive ductal carcinoma developed in the ipsilateral breast two years later, as was detected on screening MRI. The patient is a 55-year-old African American male who reported a brief history of anabolic steroid use and no family history of breast cancer. The patient had a history of multiple surgical procedures for recurrent gynecomastia over the course of many years. The patient presented to our institution for bilateral breast reduction for cosmetic purposes. Pathologic evaluation demonstrated a few foci of LCIS within the left breast along with atypical duct cell hyperplasia in a background of gynecomastia. Due to the highly unusual finding of LCIS in this male patient, genetic analysis was performed and the male XY genotype was confirmed. The patient was subsequently referred to our breast imaging center for a screening bilateral breast MRI. This demonstrated mild diffuse background enhancement bilaterally without suspicious enhancing signal abnormalities in either breast. 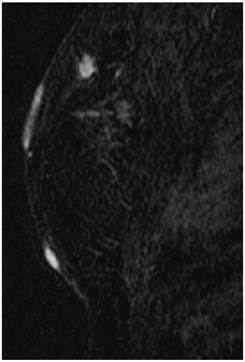 Screening annual breast MRI was recommended in view of his highly unusual diagnosis of LCIS. Screening MRI of both breasts performed 15 months later demonstrated interval development of a 1.1 cm enhancing ill-defined mass at the 1 o'clock axis of the left breast (Figure 1). 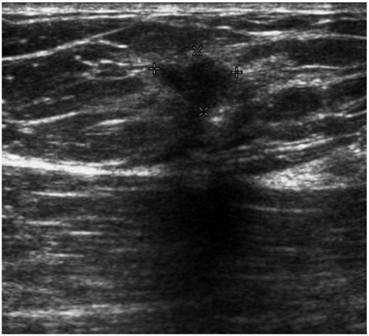 A corresponding solid hypoechoic mass with angulated margins was seen on targeted left breast ultrasound (Figure 2). Mammography demonstrated heterogeneously dense breast tissue with post surgical changes bilaterally. 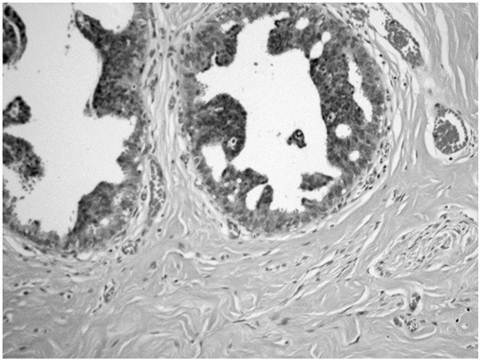 No dominant mass or suspicious clustered microcalcifications were identified in either breast (Figure 3). Ultrasound guided core biopsy yielded moderately differentiated invasive ductal carcinoma. MR image demonstrating a 1.1 cm suspicious enhancing mass at the left breast 1 o'clock axis for which targeted ultrasound was recommended. Targeted ultrasound of the left breast demonstrating a solid hypoechoic lesion at the 1 o'clock axis which corresponded to the enhancing lesion on the MRI. Digital bilateral mammogram demonstrating heterogeneously dense breast tissue and post surgical changes bilaterally. A microclip is seen at the 1 o'clock axis of the left breast, marking the site of ultrasound guided core biopsy. The patient was referred for surgical evaluation. Physical exam at that time revealed that his gynecomastia had recurred and the patient was noted to have C-cup sized breasts. He had significant hypertrophic circumareolar and inframammary scars on both breasts from his previous breast surgeries. BRCA testing was negative. Bilateral mastectomies were performed. The breast reduction specimen consisted of 426 grams of tissue from the right breast and 490 grams of tissue from the left breast. Gross examination revealed 80% fibrous tissue and 20% adipose tissue without a discrete mass. 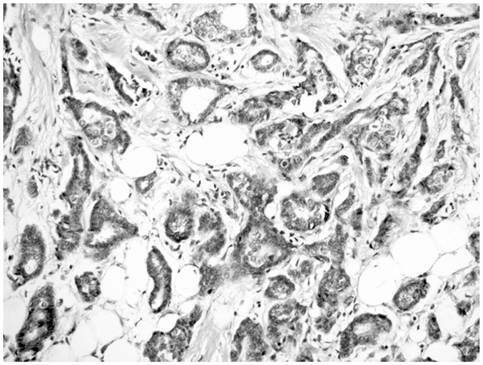 Extensive histopathologic sampling of the left breast revealed a few foci of lobular carcinoma in situ which was confirmed with a negative E-cadherin immunostain (Figures 4 and 5). Atypical duct cell hyperplasia, cribriform and micropapillary type was also present in a few foci on the left (Figure 6). Both right and left breasts revealed gynecomastia, florid phase. The ultrasound guided core biopsy specimen demonstrated invasive ductal carcinoma and subsequent bilateral mastectomy specimens revealed a 1.4 x 1.2 x 1.0 cm irregular hard mass at the 1 o'clock position of the left breast. No discrete mass was seen in the right mastectomy specimen. The breast tissue was about 60% fibrous bilaterally. Histopathologic examination of the left breast mass revealed a 1.3 cm well differentiated invasive ductal cancer with a Nottingham Score of 5 of 9, including a tubule score of 2, nuclear pleomorphism score of 2 and mitotic count score of 1 (Figure 7). The carcinoma was strongly and diffusely positive for both estrogen and progesterone receptors and negative for Her-2/Neu. Lobular carcinoma in situ was present bilaterally as was florid phase gynecomastia. Sentinel lymph nodes were negative. Monotonous small cells of lobular carcinoma in situ (thin arrows) show pagetoid extension along ducts with undermining of normal ductal epithelium (thick arrow). 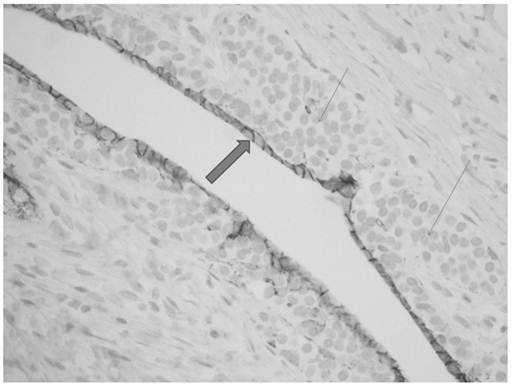 E-cadherin immunostain shows absence of staining in cells of lobular carcinoma in situ (thin arrows) with positive staining in residual benign ductal cells (thick arrow). Atypical ductal hyperplasia showing hyperchromatic cells with micropapillary type. Invasive ductal carcinoma showing a mixture of infiltrating tubules and cords of cells. Breast carcinoma in men is an uncommon disease, representing approximately 1% of all breast cancers and 1% of all malignancies in men; although based on current statistics, the incidence of male breast cancer is increasing (1,2). While the etiology of male breast cancer is uncertain, risk factors include genetic predisposition, prior radiation exposure, alterations of the estrogen-testosterone ratio, and occupational hazards (3). To date, there is no evidence linking gynecomastia with male breast cancer (4,5). Male breast cancers are predominantly of ductal origin due to the lack of terminal lobules within the male breast. As a result, LCIS and infiltrating lobular carcinoma are extremely unusual in male patients (6). Nance et al reported the first case of LCIS in a phenotypic and apparently genotypic male in 1989 in association with a large infiltrating lobular carcinoma (7); and in fact, only a limited number of cases of infiltrating lobular carcinoma of the male breast have been reported (8). Over the past decade, there has been an increase in the number of imaging studies performed in male patients. These are largely performed in patients who present with complaints of a breast lump and/or breast pain. Although there are no standardized protocols in evaluating the male breast, mammography is usually the initial study and is followed by ultrasound as needed (9). Occasionally, MRI may be obtained for further evaluation, and it has been shown that the diagnostic criteria used in the evaluation of the female breast may be applied to the male breast as well (10). However, there are no guidelines regarding screening mammography in asymptomatic men at any age due to the rarity of male breast cancer. In the absence of screening, most male patients present with clinical symptoms and more advanced disease (11). Current National Comprehensive Cancer Network guidelines for men with BRCA mutations recommend consideration of baseline mammography followed by annual mammography in those men who are shown to have gynecomastia on the baseline study (12). The role of screening MRI even in female patients with LCIS is not well established despite the fact that LCIS is known to represent a high risk marker lesion. In fact, lifetime risk estimates for patients with incidentally diagnosed LCIS range from 10 to 20%, imparting a significant lifetime risk for the development of invasive ductal or lobular carcinoma in either breast (13,14). In 2007, a retrospective study evaluated screening MRI in asymptomatic female patients with LCIS, demonstrating a small increase in early cancer detection (15). Subsequently, the 2007 American Cancer Society guidelines for screening breast MRI advised that there was insufficient evidence to recommend for or against screening MRI in patients with a known diagnosis of LCIS and only recommended annual screening breast MRI for patients with a lifetime risk of greater than 20-25% (16). The 2009 National Comprehensive Cancer Network guidelines, however, advised consideration of annual breast MR imaging as an adjunct to mammography and clinical examination in these patients (17). More recently, two additional retrospective studies specifically studied screening breast MRI in asymptomatic female patients with LCIS and concluded that screening breast MRI is a useful adjunctive tool to mammography in this high risk population (18,19). As such, one may extrapolate this information to males with a known diagnosis of LCIS and recommend screening MRI, as was done in this case. 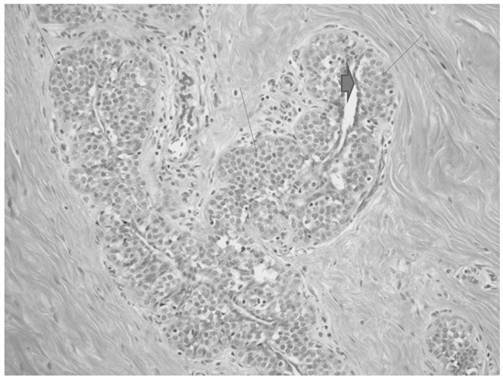 This case report is, to the best of our knowledge, the first reported case of a genotypic and phenotypic male patient without a BRCA mutation, who was found to have incidental LCIS which was unrelated to a lobular carcinoma. In addition, this is the first reported case of a male patient with LCIS to be screened with annual MRI surveillance and in whom the MRI detected a mammographically occult stage I invasive ductal carcinoma. This case highlights the importance of imaging management and the potential for an improved prognosis in men who are at high risk for breast cancer.